Here is a basic question and answer guide for new users or those who want to know a bit more about the WPN. What is a Decentralized Network? WinMX is a great example of a Decentralized Network. Basically what this means is WinMX is not run from a central site somewhere like many other p2p networks. A Decentralized Network is made up of its users and thats all. All of us make up WinMX, either as a primary connections or secondary connections. Each user of the network has files and documents stored on their own individual computers that are all linked together to create the network. 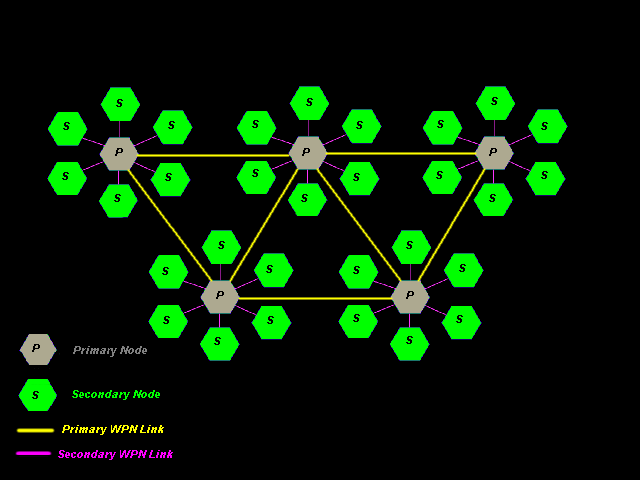 The illustration below shows a tiny portion of the network, there are hundreds of thousands of users on this network at any given time. What is a Primary connection? Primary connections are the backbone of our world on WinMX. The network requires these to allow communications back and forth from all of the users, primary or secondary. If you are on a Primary connection to WinMX you are letting traffic travel through your machine on to other machines for searching, room listings, etc. Without primary connected users on WinMX there is NO network. What is a Secondary connection? A secondary connection is a user on a low speed connection to the internet which is unable to handle WinMX network traffic. Being a secondary connection is still an important part of the network, as often they can serve as a conduit to connect primaries together and therefore help with network stability. It requires a more stable and faster connection to be a primary user than 56k or less will allow. Only Cable, DSL, T1 and T3 connections should be connecting primary to WinMX. What happens when I search for a file? When you type in keywords, in your search for files, information is sent across the network, asking for files that match your search. Information is then sent back to your computer telling it how to locate the files, the HASH number (file ID number), and the path in which to find the files. Results are sent directly to the user requesting them using information supplied in the search request itself. What is a HASH number? A HASH number is simply a way to identify each file with its own number. These numbers are decided by the file qualities such as bitrate and legnth. Typically, most files should have an individual number that only other files of the same content, bitrate, and length should match. Below is an example of a file and its hash number using the MXHashish tool. Why do I get so many results? Currently WinMX is being flooded with fake files, much like all p2p networks, by the recording industries. What this means is that real files are often harder to locate for more popular file titles. Below is an illustration of how you are being flooded by these "Agents" of the recording industry when you search for a file. Fake files are those having the same properties such as filename and bitrate as the files that they are impersonating, but have different content. They have many ways of structuring the fakes, such as inserting adverts for anti piracy, eliminating the content all together, having small bits of several files, or even no file at all. I have heard its possible to remove the fake result listings entirely, is this true ? I hope this helps you to understand how the WinMX Newtwork operates, if you need more help with basic functions go How to Use WinMX.